Down 0-2 for the second straight series, the Cleveland Cavaliers can even the series at home by making a few adjustments – but it won’t be easy. As Game 3 approaches, the Cleveland Cavaliers are in a familiar position. They are down 0-2, heading back home, and must defend their home court. This was also the case in the Eastern Conference Finals vs the Boston Celtics. Despite the media narrative, the Cavaliers played a lot of good basketball in the first two games. Without a perfect storm of unfortunate events, this is a 1-1 series, and people are feeling much differently heading into Game 3. If the Cavaliers are going to find success, they must control tempo, dominate the offensive glass, and role players must make open shots. On the defensive end, it begins with cleaning up the switches, if the game plan is to continue to switch everything. If they can not do it, then they will need to mix in some different defensive coverages, and possibly use different personnel combinations. Here are some keys to the Cavaliers getting back into the series, on both ends of the floor. 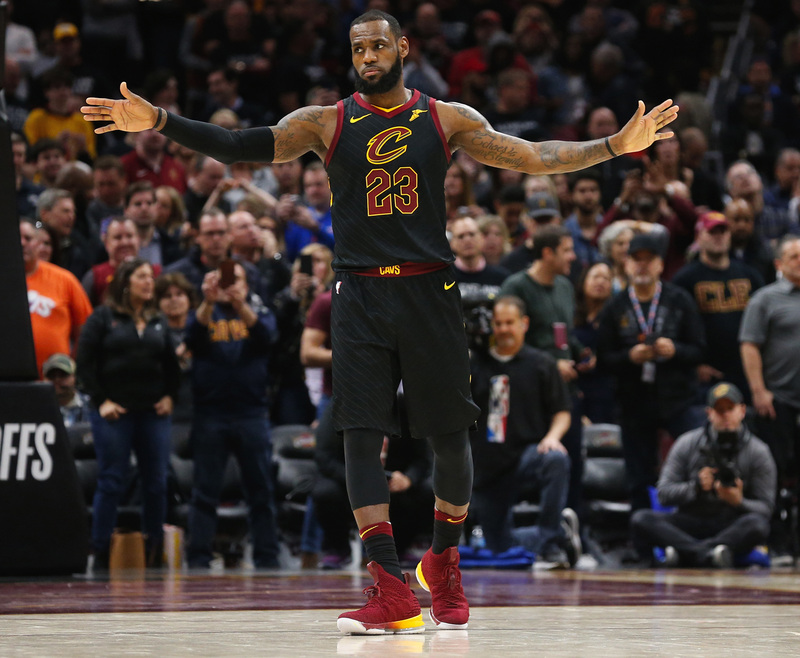 The Cavaliers did a masterful job in Game 1 of running when they had an advantage, and then being deliberate about slowing the game down if they did not find a great shot in transition. The Cavaliers dominated the offensive glass, posting a +15 advantage, which helped keep the Warriors from busting out.. This will continue to be a key, but there are also some things that the Cavs can do offensively to help themselves as well as stop the Warriors fast break attack. Throw the ball inside to Kevin Love, or mismatches when Curry gets switched onto a bigger player. These interior touches require the Warriors to be more mindful about helping inside, they generate fouls, and it results in high percentage shots. In Game 1, JR Smith, LeBron James, Jeff Green, and George Hill all scored on a post up, while being guarded by Curry. Get James more touches in the pinch post and mid post. The Cavs have had a lot of success when they get an elbow entry (pinch post) catch for him. They run effective off-ball movement which generates good shots, or an opportunity for James to attack as the help defense is occupied. The biggest key for Cleveland defensively will be to clean up its switches. The Warriors averaged 43 points in the paint, per game, in the regular season. Through two games in the NBA Finals, they are averaging 53 points in the paint. Couple this with the fact that GSW also is making more three pointers per game, and there are clearly some breakdowns in the “switch everything” scheme that the Cavs are using. In this clip, George Hill does a great job of getting underneath the roll man, but Kevin Love is late to arrive to the ball. He anticipates Curry turning the corner, so he never extends to aggressively guard the ball. This leads to a rhythm three point shot for Curry. In this clip, the Warriors effectively switch the initial screen, but the Warriors used it to get into a ball screen, including both of the Cavs bigs. There are so many things wrong with the following sequence. First off, Tristan Thompson does not jump below the roll man and Kevin Love is late to step up to Curry. Due Love’s continued struggles in getting out to the guard Curry in space, Thompson does not trust his teammate or the scheme. This leads to a completely broken coverage and an easy lay-up. The Warriors are the best in the NBA at using their shooters as screeners. This puts the defense in position to choose between helping off of a shooter, or allowing a cutter to run freely. Cleveland has committed to switching everything, but on this clip, JR Smith is afraid to leave Curry, and there is clearly no communication on the back screen. To magnify the issue, Kevin Love is inexplicably staying connected to Jordan Bell, which eliminates his ability to offer any help. This is a designed attack that is commonly used in the NBA. As previously mentioned, the defender switching onto the screener must jump underneath. On a backside Flare Action, this is extremely difficult to do. The Cavs actually used this same action multiple times in their Eastern Conference Finals match-up with the Celtics. You can find more information about it, by clicking HERE. Below is a video of the action, which all coaches should include in their “bag of tricks,” to use against switching defenses.